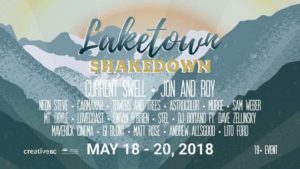 Wideglide Entertainment presents the Laketown Shakedown – May Long Weekend, the first of three summer weekends of music at Laketown Ranch in Lake Cowichan, BC Friday May 18 to Sunday May 20, 2018. The inaugural lineup has been released. The other two weekends scheduled are June 8/9 and August 31 to September 2. Those lineups are still to be announced.